Concepts Computer Lying to Us? 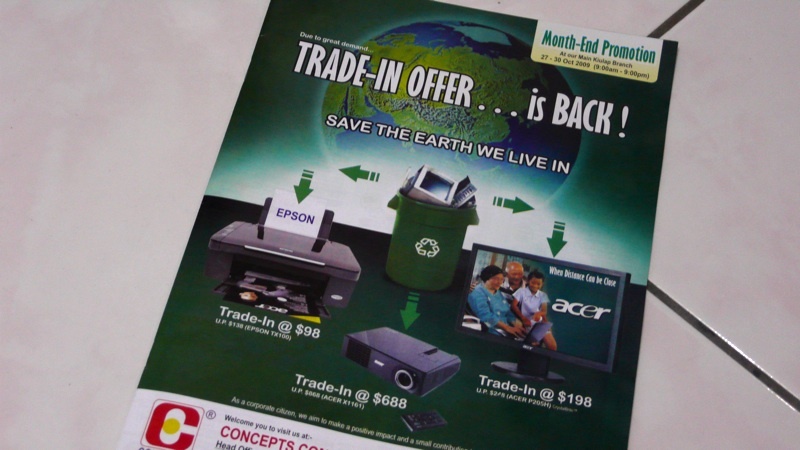 After my post of Concepts Monitor Trade-In where I found out from the owner that they were intending to throw the monitors away, I was pretty happy to see the their ad in the paper that is seen on their handout brochure shown above. “SAVE THE EARTH WE LIVE IN” it says and shows a green bin with a recycling symbol on it. I thought it was great that they are recycling all the monitors and other devices they received from the trade-in offer so I wanted to find out which recycler they were sending the stuff to. So I went to both the Kiulap and Gadong branches to find out more and I was told (at the Gadong branch last Friday) that they were sending it to a recycler in Sungai Akar. However at the Kiulap branch, I was told outrightly today that they were just dumping them and throwing it away. I asked the sales assistant to confirm that they weren’t doing any recycling at all and that they were just throwing them away and she said without hesitation that they were throwing them away. I was totally appalled! Is the brochure false and/or misleading advertising? I know it doesn’t say that they are recycling the products in black and white but from looking at the ad above how can you not say that they are pushing the message of recycling? Are they just trying to garner public support by supposedly ‘being green’? I personally like that Concepts is differentiating itself from other computer shops in Brunei by organizing seminars, events and promotions but this is severely damaging Concepts’ image in my mind and am personally thinking of even boycotting the company. Now what is the recourse to file a complaint with regards to this false advertising Brunei? Previous Post Is Your Biometric/Card Reader Secure? Request for qoute all kind of models computies.